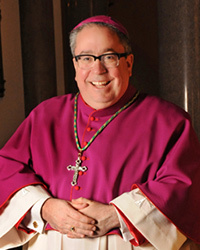 Bishop Michael Fors Olson, S.T.D., M.A. was born in Park Ridge, Illinois on June 29, 1966. He was raised in Des Plaines, Illinois where he attended St. Mary’s Parochial School. Bishop Olson graduated from Quigley Preparatory Seminary North in 1984 and began collegiate seminary studies for the Archdiocese of Chicago in August of that same year. In 1985, his family moved to Fort Worth as part of the corporate relocation of GTE/DC. In 1988, Bishop Olson officially transferred as a seminarian to the Diocese of Fort Worth. He was ordained a priest for the Diocese of Fort Worth on June 3, 1994, and began his priestly ministry as the parochial vicar of St. Michael’s Catholic Church in Bedford, Texas, from July 1994 through June, 1997. Bishop Olson was a recipient of the Basselin Scholarship at the Catholic University of America from which he earned his bachelor’s degree and master’s degree in philosophy in 1988 and 1989 respectively. Bishop Olson also has degrees (M.Div. and M.A.) in theological studies from the University of St. Thomas in Houston. He was a charter recipient of the CRS Global Fellowship in 1993 through which he traveled to Egypt and Burkina Faso to learn about global development in social justice. He is also a past recipient of the Presidential Fellowship of Saint Louis University where he studied at the Center for Health Care Ethics in the Catholic Tradition between 1997 and 2001. In March of 2011 he successfully earned his doctorate in moral theology at the Academia Alfonsiana in Rome. He has served as a community representative on the Ethics Committee for Research Involving Human Subjects at the University of Texas Medical Center in Houston. He was a member of the formation faculty at Saint Mary’s Seminary in Houston, Texas and lectured at the University of Saint Thomas School of Theology between 2001 and 2006. From July, 2006, through June, 2008 Bishop Olson served in the Diocese of Fort Worth as Vicar General and as Pastor of St. Peter the Apostle Catholic Church. Since July 1, 2008 Bishop Olson has been serving as the Rector of Holy Trinity Seminary. On May 6, 2010, Pope Benedict XVI granted him the Papal Honor of Chaplain to His Holiness with the title of "Monsignor." On January 29, 2014 Bishop Olson was ordained bishop and installed as the fourth bishop of the Diocese of Fort Worth at the Fort Worth Convention Center. Approximately 8,500 Catholics from across North Texas and beyond were in attendance.